This week’s tip of the week will assist you with guests and bonds. Firstly we will receipt a bond against a tenant. Go to your Guests icon and then find the tenant. Highlight the tenant and then click on the Bond Register icon. This is where we will receipt the funds paid by the tenant for their bond. Fill in the date, the receipt number, the amount received and the method of payment and then click on OK. When you are ready to send the receipted Bond to the RTA go back to the Guests icon, highlight your tenant and then click on the Bond Register icon again. Within the Bond Register, click on the icon that says “Sent to RTA”. Complete the date, the amount, the payee details and the cheque number if required. When you receive your receipt back from the RTA you can come back to this area and enter the RTA receipt number to keep on record. At the end of the lease bond monies are returned to you from the RTA and you can receipt these funds directly onto the tenant account or via the agent account. You may have had to use some of the bond monies to pay for items such as bond clean, or for any repairs and maintenance. 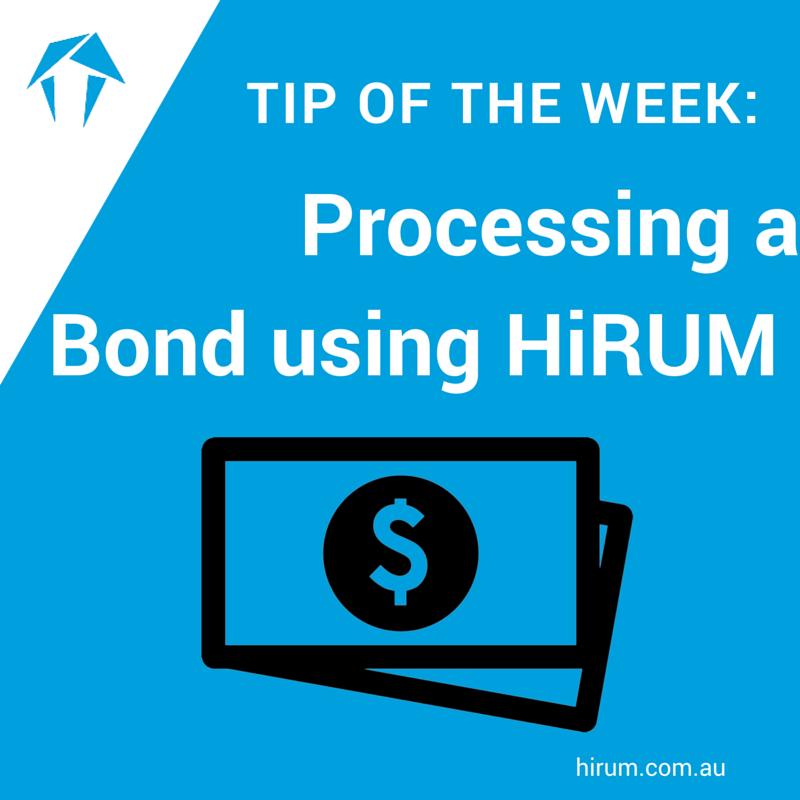 If this is the case you are able to use the bond monies to pay off a creditor in HiRUM. To receipt bond into the tenant account go back to the tenant in guests and click on the Bond Register icon. Now click onto the icon within the Bond Register that says “”Received from RTA” Go ahead and complete the date, receipt number, amount and payment method and print off a receipt. You can then go to the icon within the Bond Register called “Sent to Payees” You can choose to disburse your bond to the manager, an owner or even a creditor. Simply complete details and click OK.
It’s really important to ensure that the balance of bond must be brought back to zero. The returned bond can be disbursed between owner, manager and creditor on separate entries. Something really important to remember is that if part of the bond is to be disbursed to the owner for rental income you will need to calculate the manager’s commissions and deductions that are due to you.